You might know this by now: I love tacos. I love classic American-style tacos with ground beef, shredded Cheddar, lettuce and tomato (the kind I eat every Saturday night). I love Grilled Pork Tacos. And I especially have a thing lately for Asian-style tacos, like the kind I get from local food trucks. 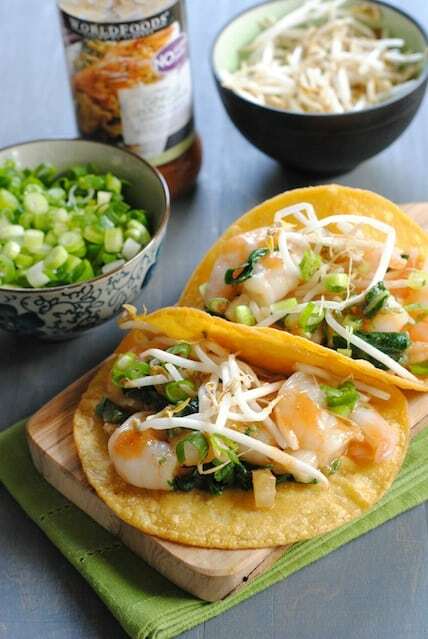 Not content to stop at Asian Short Rib Tacos, I also wanted to do an Asian-style taco with seafood. My friends at WORLDFOODS Fusion of Flavours were kind enough to send me a bunch of delicious stir-fry sauces. I immediately took a liking to their Thai Ginger Lemon Grass Stir-Fry Sauce, and these tacos were born. Tacos are one of my favorite quick meals, because they’re so fast to put together. 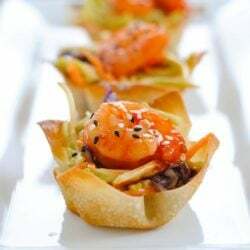 Especially when you use shrimp – even large shrimp cook super quickly! 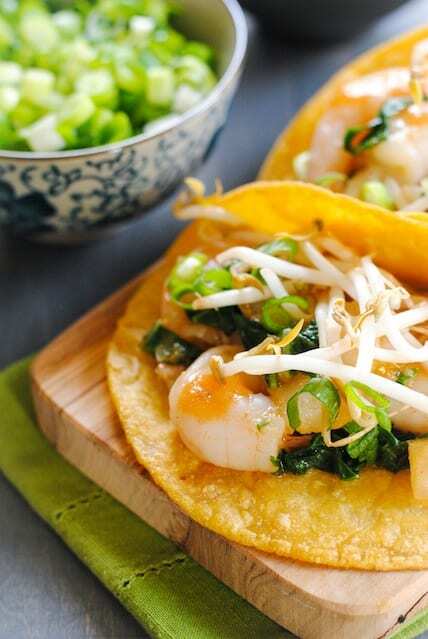 For these Thai shrimp tacos, I quickly stir-fried shrimp, chopped bok choy and sliced water chestnuts. Just before the shrimp were cooked through, I added a generous amount of the Thai Ginger Lemon Grass Stir-Fry Sauce. The sauce had all of the elements necessary to make these shrimp super flavorful – I didn’t even need to mince my own garlic or ginger (which I love, because I kind of hate mincing). The shrimp had a nice ginger bite with a background of mild lemongrass flavor. 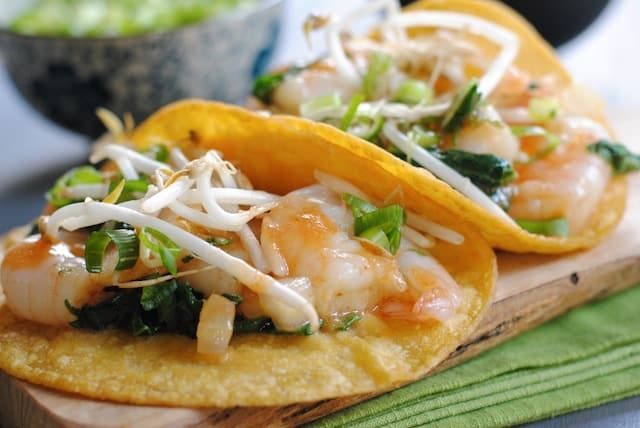 I tucked the shrimp mixture into corn tortillas, and topped it with some chopped scallions and bean sprouts for crunch. 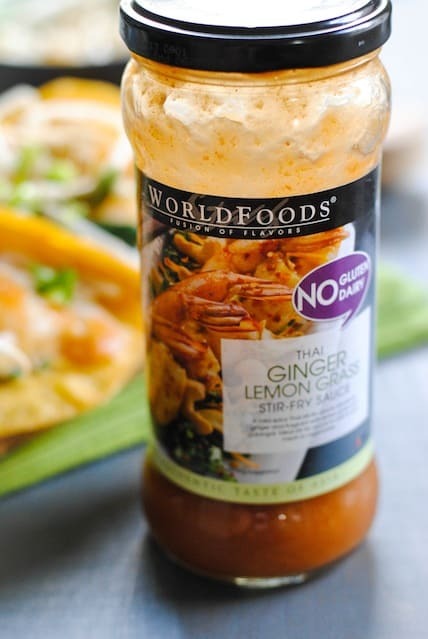 World Foods offers 51 types of Asian dipping sauces, pastes, noodle sauces, stir-fry, cooking sauces, marinades, chutneys and salad dressings. Even better, they are gluten free, trans fat free, and suitable for vegetarians, vegans and part-time vegans. Heat oil in large skillet over medium-high heat. Add water chestnuts, bok choy and shrimp; cook 3 to 4 minutes (depending on the size shrimp you are using) or until shrimp are about 3/4 of the way cooked through, stirring frequently. Add Thai Ginger Lemon Grass Stir-Fry Sauce. 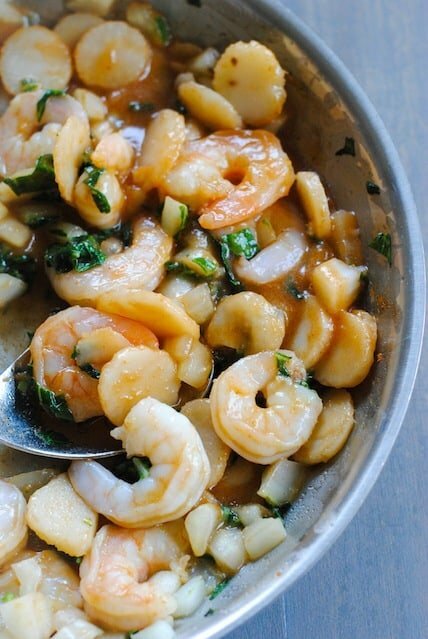 Cook 1 to 2 minutes longer or until shrimp are cooked through, stirring frequently. 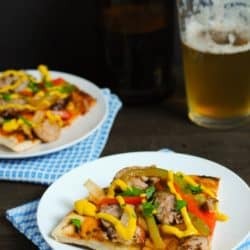 This is a sponsored post written by me on behalf of WORLDFOODS Fusion of Flavours. 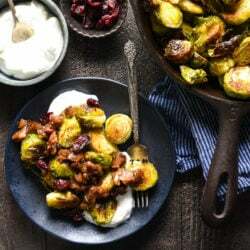 Sponsored posts help me pay for the costs associated with this blog (groceries…lots of groceries), and help support me as I pursue a career in recipe development and photography. All opinions are 100% my own. Hi. How do you warm your corn tortillas in a skillet or microwave? Do you use oil or anything when you warm them. I like mine a little stiff, but not crunchy so they break. Thanks. Hi Christina! I usually pan-fry my tortillas in a bit of oil. But sometimes, if I don’t want the mess, I’ll just warm them over an open flame on my gas range.